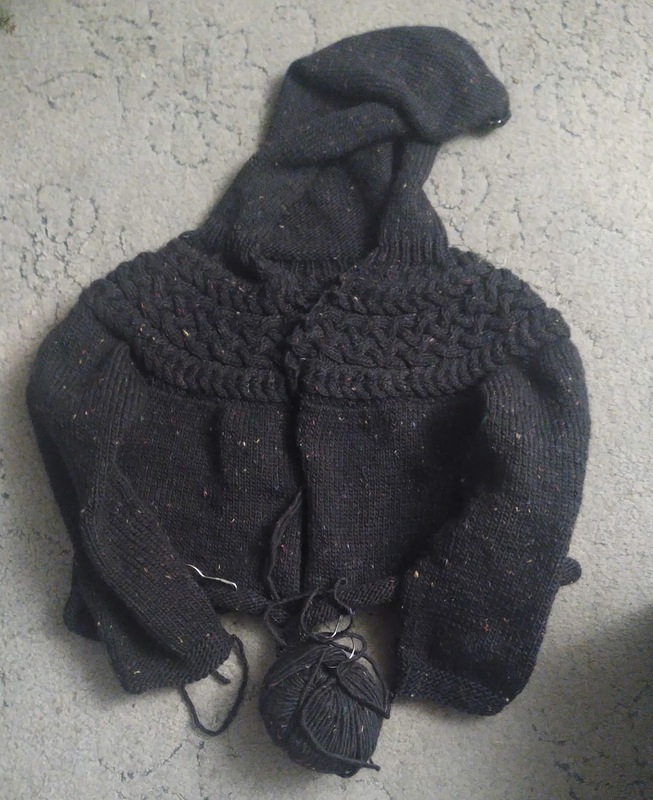 The black-or-is-it cabled jacket is growing. I stopped knitting the body last weekend and did the sleeves so that I could be sure I had plenty of yarn; but then I found two more balls of it when I restashed so I don't think I have any worries on that score. I've got around seven balls left. I think I will carry on with the body for another two balls and then that might be it. We'll see. This weekend I picked up and knitted the entire second sleeve, then ripped back and added length to the first sleeve, which was mysteriously shorter than I recalled when I tried it on. The sleeves are now the perfect length, which indicates that they will grow when I block it, but I can turn the garter edging back if that happens. It is very, very warm. Delightful to have snuggled in my lap. It is quite heavy now, though.